Back in December 1995 when I was a grad student in the bitter cold winter of West Lafayette, Indiana, my dear friend made soup one night. I ate three bowls in one sitting. Partly because we were all very poor, and didn't often eat anything that tasted this good. Partly because I was pregnant and it tasted like manna from heaven. But mostly because it was incredibly good, and different than any chicken soup I'd ever had. Since then I've tried lots of soups. My pocketbook isn't quite as bare, so I do treat myself to some yummy concoctions brewed in restaurant kitchens. Soup, I have discovered as an adult, is really good. But this soup, my friend Chris' (yes, same name same spelling...) family recipe remains one of my faves. So I'll share. Because, while it makes a lot, shipping you each a bowl just isn't practical. Cut veggies of your choice. Boil potatoes (or some pasta of your choice) until done. If potatoes, make sure a fork goes into them easily. Drain. In a big pot (really big, I tell you, this makes at least 10 servings), add 3 cans of chicken broth, undrained canned tomatoes and veggies. Add chicken and potatoes. Add the garlic, basil and oregano. I don't really know how much I use, but I am heavy with the spices. Add salt and pepper to taste -- I like it pepperier, so I don't add much salt. Simmer everything until the veggies are tender and the flavors blend. If you decide to use pasta, add it at the end. Sometimes I make a little pasta each time I reheat this and add it before serving. I just don't like mushy pasta. That's why the potatoes are in there. I like to add a bit of Parmesan to the top before eating, too. Enjoy. Thank you for the soup recipe. It's nothing better than a great bowl of soup on a cool fall night....I'm trying it tonight. I never liked soup that much as a kid, but now it is my fall/winter/early spring staple. We really like a MS Kids minestrone with broccoli, too. (It won't let me leave the link, but I'll e-mail it if you want it.) Thanks for adding one more to my file box. Sounds yummy and looks even better! I love love love soup -- I can't wait to try it! Anyway. I love soup. My mother used to make soup a lot when we were growing up and I make it a lot, too. Not all of my boys appreciate it as much as I do. 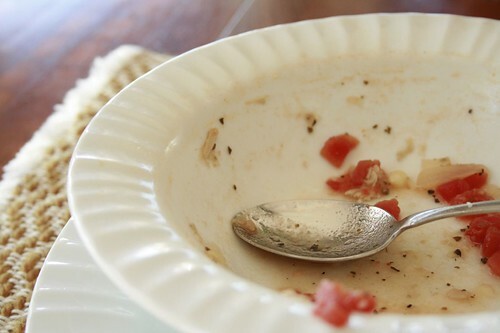 Last week I made broccoli cheese soup twice and 3 of the oldest boys ate it! It's a miracle. I have two great soup recipes with cans of italian tomatoes in the ingredients...now I have three. Thanks! 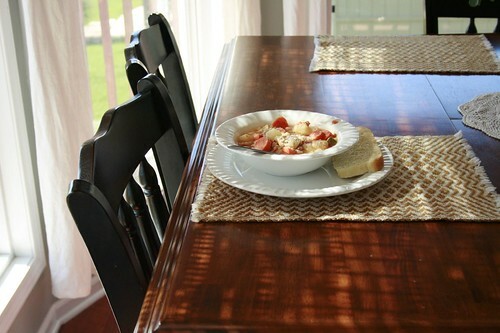 Your soup looks sooo good! Thanks for sharing the recipe!!! Good Stuff Maynard. I'm always looking for new soup recipes. Hey! You're not quiet-ish over here. My bloglines hath failed me. thanks for the recipe...sounds nummy! I could go for a bowl of that soup right now--it looks so yummy! We made your soup for dinner tonight - only I added dumplings on top and the kids wanted cheddar cheese instead of parmesean. SO yummy. Thanks! This sounds so good. My family and I love soup. 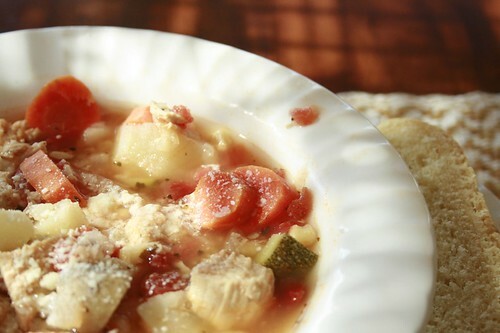 I have a great vegetable beef soup that we all love, but still working on a good chicken soup recipe. I'll be trying this one next week for sure. Thank you.